On Nag Panchami, the women draw figures of snakes on the walls of their houses using a mixture of black powder, cow dung and milk. Then offerings of milk, ghee, water and rice are made. 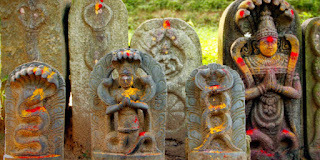 It is believed that in reward for this worship, snakes will never bite any member of the family. The snake deity worshipped on Naag Panchami is the goddess Manasa.